It also helps make our community outreach efforts possible, and supports updating and printing the Yarmouth Resource Guide. 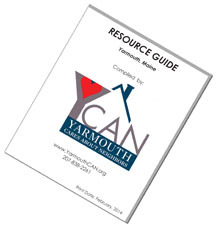 You may make an unrestricted donation to Yarmouth Cares About Neighbors (YCAN), or specify that your donation should be devoted exclusively to one of the programs listed above by noting it on the Memo line of your check. Yarmouth CAN is a 501(c)(3) private, non-profit organization, so your contribution is eligible to be deducted on your federal and/or state taxes. Please make checks payable to Yarmouth CAN. 1) May we identify you as a donor to Yarmouth Cares About Neighbors (YCAN), or do you wish to remain anonymous? 2) What do you wish your gift to be used for? If no specific use is specified, we will use it wherever it is most needed. If you would like your contribution to go specifically to the Yarmouth Heating Assistance Fund, Yarmouth Community Food Pantry, Lunch Crunch, The Nutrition Closet, Project Holiday, or Operation Bundle-Up, please note this on the memo line of your check, or in a note that you include in the envelope. A mother of two grown children who was living alone in an apartment, and had been out of work for six years with back problems. She generally relied on family members for assistance, but the Fuel Assistance was greatly appreciated last year. In order to conserve her fuel for when it was most needed, she heated water for dish-washing on the stove and took showers sparingly. She could not have gotten through the winter without help from the Fuel Assistance Fund.